When the Federal Reserve raised interest rates a measly 0.25% last December, some investors thought it was about time. After all, pundits had been warning of rising rates. But many investors (KeyStone included) were skeptical that the U.S. economy was ready for liftoff. Instead, they saw a failure to launch. Investors are now acting like another rate hike in 2016 is nigh impossible. After an ugly May jobs report, an expected June rate hike was quickly tabled. 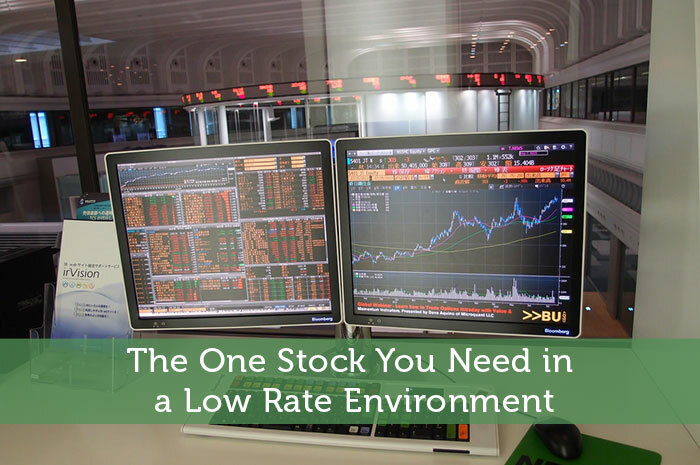 While the writing continues to be on the wall for a continued extended period of low rates, investors still haven’t gotten the memo: Get used to low rates. Action: Buy dividend growers (but we will get back to this). To be sure, the vast majority of investors are hopeful that the recovery will stick, so it’s natural to believe the U.S. economy is stronger and more prepared for tighter monetary policy than what is reality. But like it or not, the U.S. continues to suffer the overhang from an unusually deep and long-lasting recession — a “secular stagnation” where output and employment measures remain weak in the long-term despite aggressive monetary policies. The fact that the U.S. has not seen inflation-adjusted GDP growth above 3% for a decade, and still may not see a growth rate that robust for several more years is a bitter pill – but it’s the reality. We also live in a new technological and globalized era, where the economic models of 2016 tend to conserve much more capital than in ages past when there was more demand for big investments in labor and brick-and-mortar facilities. The Amazon’s and Ubers of the world help us access goods and services more quickly and at lower cost, but there isn’t the same level of capital investment as there was under the old model of big-box stores and Yellow Cab buying a fleet of Ford Taurus’s. The sad reality is that until and unless the U.S. posts employment metrics that are consistently strong, or inflation rises significantly and stays elevated, there simply isn’t a case for hiking interest rates this month, this year — and even next year. So what does this mean for your portfolio – if you are seeking yield, bonds, t-bills, GICs, etc. will continue to leave you wanting. The answer may continue to be Dividend Growth Stocks – or those stocks that consistently growth their dividends and the underlying business over time. 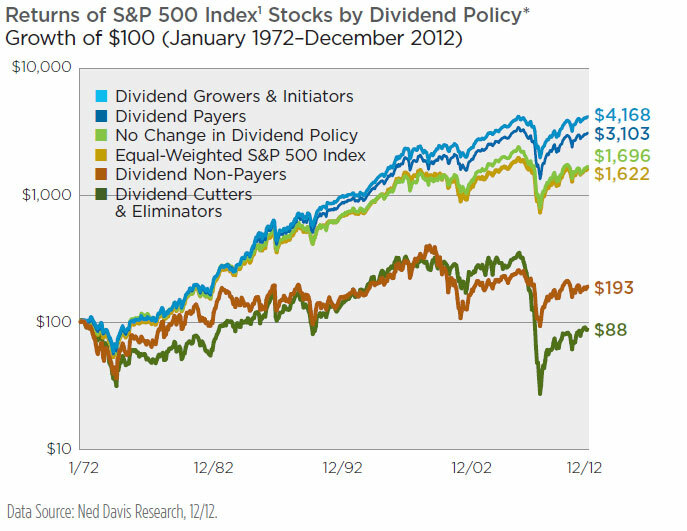 The graph below (from Ned Davis Research) clearly illustrates that over a 30 year time horizon, dividend stocks on the S&P500 generated a total return of 10.19% per year compared to the 4.39% generated from non-dividend stocks (a nearly 6% difference). We can also see from the graph that this margin of superior performance has widened in the more recent years. The true out-performers were the dividend “growers” and those that initiated dividends due to their consistent and growing cash flow. While no dividend – or stock – is 100% guaranteed, the market alwyas provides some select opportunities to buy strong, well-capitalized companies with solid dividend yields and the potential to growth them long-term. These are the stocks you want to own. All dividend payers are not created equal, and you want to find the ones that have the businesses to back up their payments. Strong businesses will maintain or even increase their dividends, even in a market like this one. So how do you tell if a business is strong? Many people use the earnings payout ratio (dividends per share / earnings per share), but those numbers aren’t always reliable because a company can strategically adjust net income for any number of reasons. Rather, focus on the free cash flow payout ratio. It’s much more difficult to fake the cash flow, and that means investors can have more confidence in it as a measure of dividend health. Ideally, you want to find companies with free cash flow payout ratios below 80% (we often see dividend growers with payout ratios of 50% and below), which demonstrates that the company has an adequate cash cushion to maintain its dividend payments — and even raise them. It’s important to keep in mind that no individual company, however strong, is immune to the kind of sectorwide that brought down energy stocks in 2015 for example — even after many “big oils” paid uninterrupted dividends for years. That’s why diversification across sectors is important, even if that means sacrificing a little yield. But do not overdiversify – we recommend selecting 10-12 individual dividend growth stocks. And take your time. 12-16 months is often necessary. One of the simplest ways is through and ETF. The iShares S&P US Dividend Growers Index Fund (CUD) aims to replicate the performance of the S&P High Yield Dividend Aristocrats CAD Hedged Index, net of expenses. The Index selects the 60 highest dividend yielding stocks in the S&P Composite 1500 Index that have increased dividends every year for at least 25 consecutive years. The Index is weighted by indicated annual dividend yield, with constitutents being reweighted every quarter. 1. Exposure to high yielding U.S. companies with a track record of growing dividends over time. 2. Underlying index screens for high yielding U.S. stocks that have also increased dividends for at least 20 consecutive years. 3. Earn a regular, potentially growing, monthly dividend income stream. Or you could buy big, stalwart, dividend growers like Johnson & Johnson (JNJ:NYSE). Johnson & Johnson is the largest health care corporation in the world. The company was founded in 1886 and currently has a market cap of more than $280 billion. There are two telling numbers to remember when analyzing Johnson & Johnson stock: 31 and 53. As in 31 consecutive years of adjusted earnings-per-share increases and 53 consecutive years of dividend increases. In addition to these impressive metrics, Johnson & Johnson has one of the lowest stock price standard deviations of any company. With its low volatility and long history of predictable growth, Johnson & Johnson has more in common with a utility (except it has better growth prospects) than with most other health care corporations. But we think there is a better way. Create your own Dividend Growth Stock Portfolio composed of smaller, high growth dividend payers that remain “off the radar” of the broader market. In our next column, we will highlight a cash rich NYSE listed software as a service stock that pays a solid dividend (around 30% of cash flow) and trades at under $4.00. This will give you a great start on your own Dividend Growth Stock Portfolio – stay tuned!